Nothing in this world is certain, except death. The Reaper comes for us all in the end. Sometimes that end is horrible, violent and cruel. Sometimes it is a lingering, painful path to rot and ruin, pockmarked with despair and regret. Most of us cannot bear to contemplate this. But in those secret moments when we do allow ourselves to envision our own departure from this world, we ache for it to come swiftly, cleanly. Such a death is the ultimate mercy, the ultimate kindness. Three days ago, on a cold and rainy hillside in Wyoming, I delivered that ultimate kindness to a dying fawn. And in the hours since, I have been unable to shake the image of that young animal from my mind — nor have I been able to fathom the seeming courage with which it faced me, a handservant of the Reaper. I’d come to Wyoming in search of antelope, one of my favorite game meats and one I’d not had the privilege of eating since I shot my last ‘lopes in 2006. My friend Sheamus and his friends Allen and Tad invited me along on their antelope hunt, and I eagerly accepted. Allen and Tad were old hands at hunting pronghorn, and were good enough to do it consistently on public land. But when we went to buy our tags at the sporting goods store in Caspar, we found that the area where Allen had planned to hunt was sold out. So Sheamus and I had to buy tags for a neighboring region, one none of us had ever seen. Sheamus is a chef more interested in meat than horns, and since I already have the skull of a big buck antelope on my wall, we each bought tags that allowed us to kill an antelope doe or fawn instead of a buck. Into the truck we went, full of hope. Antelope hunting in Northern Wyoming is not the toughest endeavor in the world. 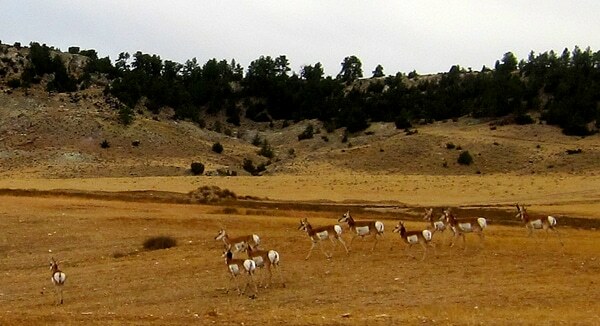 There’s probably a higher concentration of pronghorn there than in any other place in North America. They are everywhere. The trick, however, is finding them on land you have permission to hunt. The country we were driving through was sweeping and stark. For starters, these are the high plains. They begin at 5000 feet and go up from there. The wind is constant. Red rock cliffs fade into scrubby shortgrass prairie. Deep coulees hold mule deer, creek bottoms whitetail deer and turkeys. Look around and you are overwhelmed with a sense of beige. Everything is beige: The grasses, the hillsides, the antelope. And sure enough, we found antelope. Lots of them. Tad checked a nifty GPS device he had that showed us which was public land and which was private. Again and again and again, the answer was the same: Private. Hours passed. Finally, Sheamus spotted a lone pronghorn bedded down on the side of a grassy hillside. Tad checked his GPS. “Green light! We can shoot him!” I was up first, so I slipped out of the truck, rifle in hand. I needed to cross a road and get over a fence before I was legal to shoot — all in plain view of the sitting antelope. My heart hammered against my chest, and only a little of it was because of the altitude. I knew this was probably my only chance to get an antelope and I did not want to mess it up. But surely the pronghorn would run off if I got close to it? I decided to try something that’s always worked with other animals: I walked along the road away from it, not looking. For whatever reason, not looking directly at animals seems not to spook them when I do it. I crossed the fence a few yards down the road and jammed a few shells into my rifle. I glanced to my left, up the hillside. The antelope was still there. So far so good. I looked at the antelope through my scope. My heart sank a bit: It was a little boy fawn, not a fat doe as I’d hoped. But some meat is better than none, I reckoned. I also realized that from where I was sitting, this would be a long shot. I don’t much like long shots, so I decided to walk away from the pronghorn again to get myself around a little knob, where he could not see me. I could get much closer to him by coming up from behind the knob and shooting down from the top. I worked my way around while Sheamus and crew watched from the truck. As I got closer, I dropped to my knees. When I reached the lip, I crawled. The fawn should be just below me, I thought. But he wasn’t. Had he walked away while I was behind the knob? I could just imagine everyone laughing at me in the truck. Letting me belly crawl over cactus for nothing. Where the hell had this antelope gone? I looked to the right, and there he was, this time much closer. He was still bedded down, looking at me, calmly chewing grass. I was stunned. No animal should be that calm with a predator so close. Why didn’t he get up? Then it dawned on me. Something was wrong with this fawn. Something serious. Was he sick? Injured? I looked through the scope again. There he was, looking for all the world like he was just chewing his lunch on any other Monday afternoon. And he was still looking at me. For a moment I thought I ought to just walk up on this antelope to see what he would do. Maybe he was just young and foolish, maybe I could teach him to fear humans. But I didn’t. I didn’t do that because, quite frankly, I wanted the meat. If I don’t kill a deer or some other sort of venison each year, I don’t eat red meat. I’ve lived this way since 2004, and I am not about to stop. So I did what I set out to do. I set the crosshairs of my rifle on the best target I had available: The spine at the base of his neck. My pounding heart bounced the crosshairs mercilessly until I took a long, deep breath to calm myself. The last image I had before the world exploded was that fawn looking directly at me. I did not see the antelope die, but I heard the thud of the bullet hitting him. When I looked up, he was stone dead. I chambered another round just in case he got up, and walked towards him, about 100 yards away. As I drew closer, I saw an odd dark patch near his foreleg. What?! Had I just shot him in the leg? Then why is he dead? Standing over the dead pronghorn, I was at first struck by how small he was. Probably born in June, he could not have weighed more than 50 pounds. Then I saw what the dark patch was. Something, probably a coyote, had almost completely torn off this poor fawn’s foreleg. It was hanging only by a small bit of muscle and skin. A horrible wound, a fatal wound. The yearling had not run away because he couldn’t. But three-legged animals can certainly stand, and many can walk. So why had he not stood up and even tried to escape? Was he addled by his injury, which looked to be only a couple days old? I knelt down and put a tuft of grass in his mouth as a sign of respect; it’s a German tradition, a final gift of food to the fallen. By the time I stood up, Sheamus was walking up the hill to help me out. We carried the pronghorn in silence and carried him back toward the truck. I skinned and quartered him quickly. We remarked that he was almost the exact size and color of a baby goat. “That’s gonna be some good meat,” Tad said. He’s right. Holly and I will probably get six meals from that little antelope. But I can’t stop thinking about its fate. I know in my heart I did the right thing. Not every hunter would have chosen to use his tag on such an animal. And had we left him, the yearling would have died of starvation or, more likely, have been torn to pieces by the coyotes when they returned for him in the night. My brain tells me that this fawn did not know this, that he could not possibly look his death in the eye serene in the knowledge that with his leg in ruins, a bullet was the best of all possible ends. My heart says otherwise. And I can only hope to show such courage when the Reaper comes for me. Thanks, Hank. I’ve always said that hunting is defined by honor and respect, as much as by skill or stamina. Respect for the land you’re hunting; respect for the weapon you’re carrying; and respect for the animal you’re harvesting. Thanks Hank. I came to your site looking for a recipe and stayed to read your many great tributes to the animals and their pursuit, the sentiments of which many of us share. Nature’s death ethic seems cruel from our perspective and I have made far too many mercy killings over the years. This past summer here in southwest Pennsylvania I spotted a couple month old fawn standing with all four feet in the edge of a pond. I though I’d see how close I could get before it ran. It didn’t run. As I approached I could see that it had a wound and was being eaten alive by thousands of maggots. I couldn’t get back home for the gun fast enough and have never had a mercy kill that was so clearly the right thing to do. Several years ago my daughter, probably 8 years old at the time, came to me crying because she found a young rabbit that had an encounter with the lawn mower and I wasn’t there to deal with it. She had to “do that thing I do where I twist their neck to end the suffering”. She is now 25 and a nurse. I’m still proud of the courage and compassion she showed that day. If your tour brings you to Pittsburgh I’d love to be there and to meet you. What a beautifully written story, Hank. Looking forward to getting the new book. A wonderful post! I just found your blog through SimplyRecipes and I’m so glad I did. I’m an Italian food blogger but my son hunts and he shares his captures. For the first time last year, he did get an antelope in Wyoming. The meat is wonderful and I was so happy to share the recipe with my readers. I’m always looking for more information to share and you write beautifully. I’ll gladly link some of your info to my readers.